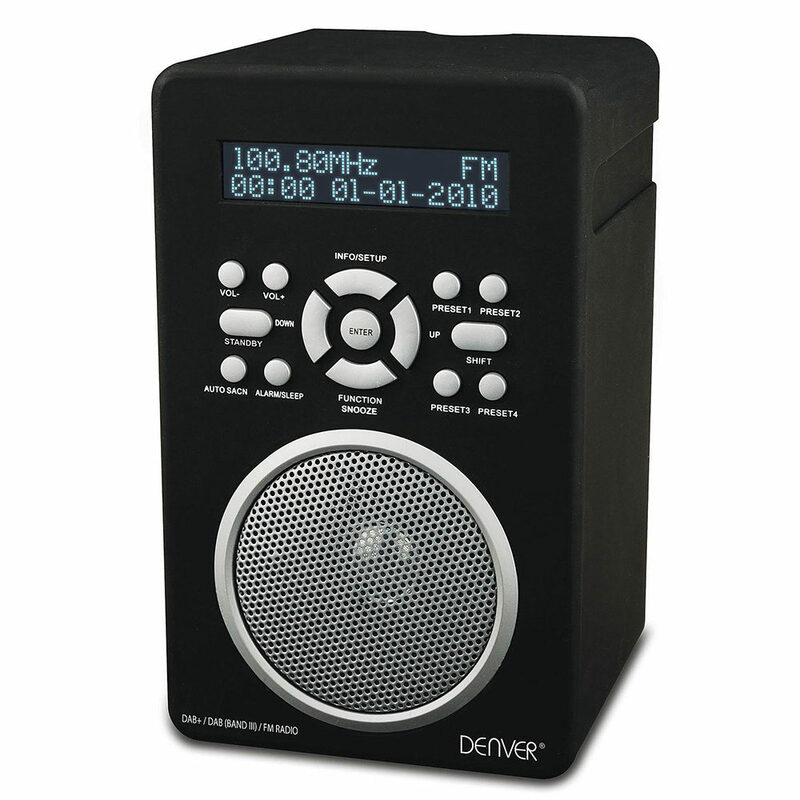 The Denver DAB-43Plus is a compact DAB and FM digital radio finished in a rubberised coating and produced in several colours. At 10.4 x 15.5 x 9.5 cm the DAB-43Plus digital radio is small enough to be conveniently placed anywhere but large enough for a good quality audio. 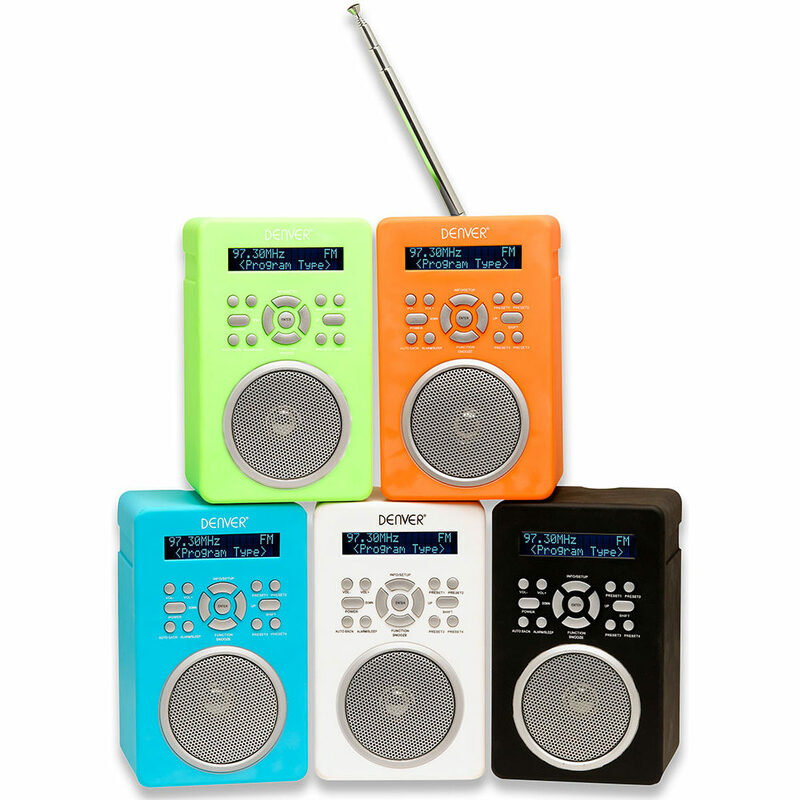 With mains or battery power this compact DAB radio is extremely flexible and ideal for kitchen, bathroom or bedroom. Switch the DAB-43Plus between FM or DAB digital radio depending on your location and the radio station you want to listen to. With 8 station preset options you can save your favourite channels for easy switching. The DAB-43Plus has an integrated clock and alarm so you can wait up to your favourite radio station… alternatively if you’re a heavy sleeper switch the alarm to beep. Auxiliary connection on the rear means you can connect your MP3 player or other audio device to the DAB-43Plus to play the audio via the DAB-43Plus speaker. Great little radio, simple to use and the sound quality is good. The block shape is classic and will fit any décor, value for the money. No worries. It does what it says! Sound is good for a small device like this. Batteries do not last too long though, if you are using those to power it. But that is not the radio’s fault, I suppose. Very compact and has some good features like an aerial instead of the wire, which either gets ripped out or bitten off if you have pets. Great texture from the rubber coating and can be placed into a small area, ideal for my workshop. Gives a very strong sound and the DAB signal is good. Probably one of the best prices I have seen for this type of product, even has an alarm if you need one. Time will tell though if this has longevity. DAB radios have been pricey for a long time, now it’s getting more affordable. Good sound and controls are easy to use and understand once you understand the booklet. Also portable, using AA batteries. All in all a very good radio. Works great up to now use it in my bathroom in shaving socket looks really smart and nice compact size. Purchased this for the kitchen as it is small and looks good. It sounds good and i found it easy to operate. Great little radio ideal for a kitchen shed garage etc useful aux port so you can enhance its sound quality thru an additional speaker should want to go lowder. A great little radio for the price. One thing I did not like was the on off switch on the back, feel this would be better located on side or the front. Also it is a bit fiddly. I live in a bad reception area so find I have to switch from dab to fm but that is not the fault of this device but signal in general. I like the size and compact design. Attractive looking radio with a sturdy, possibly outsize telescopic aerial (if you are picky about these things). Nice smooth, slightly soft & rubbery feeling cabinet. Good easy to operate controls. Excellent DAB radio reception, with DAB+ for those who might wish to use this radio elsewhere in Europe, Australia, etc. DAB Radios made by Roberts & Pure that are sold in the UK have DAB+capability disabled to save the manufacturer licensing costs. Annoying if you wish to use your expensive radio in other countries. The reason that I am not as impressed with this product as a clock is because the time is not displayed while the radio is in standby mode, display brightness & alarm volumes are not adjustable. Very happy with the service from 3 Wise Monkeys. I had a query prior to purchase which was answered promptly & accurately. The radio was well packed & delivered swiftly. Top marks.